MilkyWay@home passes 50% of fundraising goal!! Message boards : News : MilkyWay@home passes 50% of fundraising goal!! "I would like to personally thank each and every MilkyWay@home supporter who has helped us to raise $21,843.97 towards our goal of $40,480 to keep up operations through summer 2015. So far, 324 people have sent money by credit card, Paypal, and check to support our work of tracing tidal streams in the Milky Way halo and using them to determine the location of dark matter. We have received donations from $0.23 to $5000 (Wow! ), and sent out 36 fabulous T-shirts to donors. Some of you have included really wonderful notes along with your donations, that I have really appreciated. Message 62045 - Posted: 16 Jul 2014, 11:51:42 UTC - in response to Message 62042. I would be MORE THAN HAPPY to crunch / mine on a campaign for MilkyWay support. Message 62047 - Posted: 16 Jul 2014, 19:34:56 UTC - in response to Message 62045. Already working on it Phil. Thank you for the info. Bit Utopia has begun fundraising for Milkyway. They will generate Bitcoins which will then be converted to US Dollars and donated to Milkyway via Paypal. Message 62050 - Posted: 17 Jul 2014, 11:11:14 UTC - in response to Message 62049. I am VERY GLAD you guys were able to work something out!!!! Message 62053 - Posted: 17 Jul 2014, 14:21:21 UTC - in response to Message 62049. This is simply awe-inspiring. 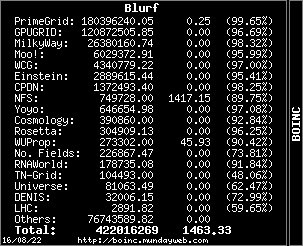 A BOINC project that crunches to raise money for another BOINC project. Wonderful, wonderful. I'm really happy to see this is happening !!! Will do my best to help you, together with all other BU and MW crunchers. Message 62057 - Posted: 18 Jul 2014, 21:37:42 UTC - in response to Message 62042.